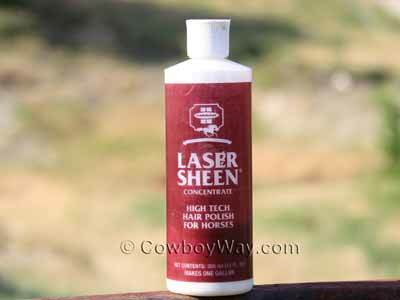 Laser Sheen Concentrate by Farnam is a silicone hair polish that shines your horse's coat and detangles and shines their mane and tail. Laser sheen helps to repel dust and dirt, and also helps prevent stains on the hair from grass, urine, manure, and latigo. To learn more about Laser Sheen Concentrate, please scroll down. Below: A 12 ounce bottle of Laser Sheen Concentrate (makes one gallon). Laser Sheen Concentrate is easy to measure: The bottle has a window labeled in 1 ounce increments to help you measure the correct amount without any special measuring tools. 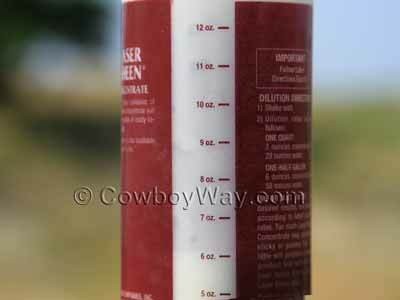 Below: A bottle of Laser Sheen concentrate showing the measurements. If you find some Laser Sheen you like but you're not ready to purchase it right away, you can always add it to your shopping cart so it will be easy to find later. In most cases, Amazon will keep track of the items in your shopping cart for 90 days. In the meantime, if you want to check out with other items, click "Save for later" to move the halter to a separate, but still easy-to-find list beneath your shopping cart. Important: Putting Laser Sheen or any item in your Amazon shopping cart or "Save for later" list does NOT reserve it! It just makes it easier to find if it's still in stock when you come back.